Mousse: Melt chocolate in heatproof bowl, set over hot water and let cool slightly. Sprinkle gelatin over 1/4 cup of cold water in small saucepan. Warm over medium-low heat until dissolved. In bowl, whisk together egg yolks, vanilla extract, sugar and 1 tablespoon hot water until thickened. Add gelatin and whisk until combined. Using electric mixer beat egg whites until firm peaks. Whip cream and fold into gelatin mixture. Fold in egg whites and melted chocolate until well combined. Cover and refrigerate for 4 hours or until set. Sauce: Meanwhile, in saucepan bring Wild Blueberries, Amaretto and orange rind to boil. Whisk cornstarch with 1/4 cup of water and stir into Wild Blueberry mixture. Cook, stirring for 1 minute or until thickened. Let cool. 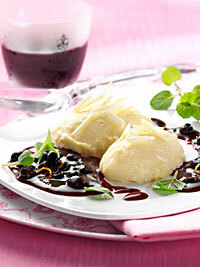 Using ice cream scoop, scoop out mousse onto plates decoratively and spoon sauce around the mousse. Sprinkle with shaved chocolate and garnish with fresh mint. Preparation Tine: 15 minutes; Chill Time 4 hours. Serves 4.